Song Legacy will create a unique customized wedding anniversary song as a gift for your loved one, parents, or friends! Based on your answers to some questions, lyricists will write lyrics that capture the life story of the anniversary couple, set to original music by one of our composers. Your personalized anniversary song will be recorded by a professional vocalist. Song Legacy personalized music can turn a wedding anniversary celebration into an unforgettable event by capturing the life story of the guests of honor, and it can also be written on a CD which will be cherished for years to come. 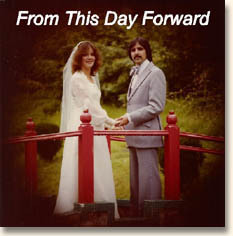 Learn about the Products we offer: personalized anniversary songs and inexpensive MP3 downloads of original anniversary songs. Hear song samples in our list of Favorite Anniversary Songs. See sample personalized lyric sheets. Read a few comments from customers about our customized anniversary songs. We hope our Anniversary Links will help you plan your anniversary celebration. Go to the Song Legacy website to learn more about the company. Principal lyricists and performers include Kathleen Tarp and Andrea Carter. For those on a tight budget, we also offer MP3 files of original wedding anniversary songs for only $9.99 - a great idea for last-minute gifts! Learn more about these original anniversary songs. For samples of our original songs, see our Favorite Anniversary Songs page, fill out our online Contact Form, or contact us via e-mail or phone using the addresses below, or go to the Song Legacy website to learn more about our company.